Boundaries are an interesting subject. Some people hold their boundaries very tightly and others are too loose with theirs. I believe the best way is to hold them firmly but with some flexibility. 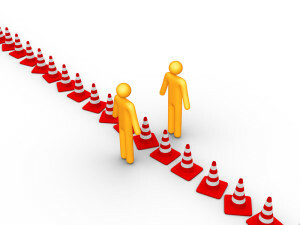 If boundaries are too tight or too loose, then we can end up with health problems. Imagine your boundaries are too loose. You let anyone take advantage of your good nature. You find it hard to say no to people. You allow people to turn up at your house unannounced whenever they feel like it. You get cornered at parties by people you don’t really want an extended conversation with. 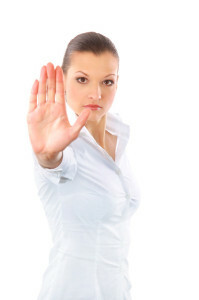 You put up with unreasonable behaviour from people because you don’t want to risk conflict. I could find many other examples. Now imagine your boundaries are too tight. You don’t do anything if it hasn't been in the diary at least a week. You don’t let anyone in emotionally. You are rigid about not giving anything away for fear of being taken advantage of. You find it hard to form relationships with people and can appear withdrawn or aloof. Boundaries can be physical, emotional or behavioural. And your boundaries might not be the same strength in each of these areas. For example, you may be very friendly but hate hugging someone. Or you might be emotionally withdrawn, but will offer to help people to the extent that you have no time left for yourself. Now, we are usually born with no boundaries. We have yet to learn about them and so as a baby, we will generally be quite happy being passed around from person to person for a hug. Babies are generally very trusting, hence why they rely on responsible adults to keep them safe. As we get older, we develop boundaries through experience and learning. Our parents will teach us not to talk to strangers. They may well tell us not to give away everything we own because they're not going to buy us a whole lot of new stuff. However, we also develop boundaries from our own life experiences. We may find that we are taken advantage of for being too generous. We may find that we get hurt if we're too open. We may find that we feel uncomfortable when strangers give us a hug. And so we start to bring our boundaries in to such a level as to keep us feeling safe. This is an important part of development and necessary for our wellbeing. However we also learn from our friends and from society as a whole. Some of these things may be helpful, for example, our friends feel loved when we give them a hug. But some of them may be more destructive, for example if we think we need to be promiscuous to be cool. What's healthy is different for different people, but usually it consists of only giving as much as you freely want to with no conditions. Now, if we are giving too much, ie our boundaries are too loose, then our energy is likely to become depleted. The end result of this is chronic fatigue. I've worked with people who have lost their spark, they've lost their enthusiasm for life and they don't have motivation for even the fun stuff. However, if we wall ourselves off from the world, only letting people in with a signed invitation in triplicate, then our hearts become closed and this will not only cause us to become isolated, but can also eventually lead to health problems. We are naturally sociable beings, so if we're closing up and going against our nature, there is probably some kind of trauma or stress underlying it. It's hard to change our level of boundaries. We may feel guilty about tightening up boundaries that were too loose. We may feel that we're becoming a bad person for not giving as much of ourselves as we did before and this might be difficult to adjust to. However, as long as you are firm about where you stand, people will usually respect you for being clear about things. The trouble comes when people who are used to the "old" you, struggle with adapting to the "new" you. But this is their problem. The important ones will work it out. It's also quite hard to open up and loosen tight boundaries. This can feel quite vulnerable and can feel quite risky. However, no-one is suggesting you have to open up in one go. It might be easier to take little steps and test the response you get at each stage. And it may be that it's not appropriate to open up the same amount with everyone. Again, as with many of my other blogs, I will say that it's perfectly possible to do this adjustment by yourself, but if you're finding it difficult, then a therapist can often be of help. It's not necessary in today's society to struggle alone. So I hope this gives you some food for thought about boundaries and the effect of not setting them at a healthy level. 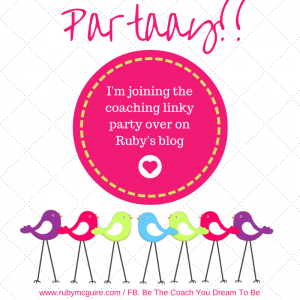 This blog post is featured on Ruby McGuire's Linky Party. The relationship we have (or had, if they have passed on) with our parents is the most important and fundamental one we'll ever have. And I'm going to explain just why this is. Love them or hate them, they are the people who will have influenced us the most in our life. They are usually the first people we bond with. Or if, for whatever reason, they aren't, that is also significant. They are the people who teach us about the world. When we are born we have no frame of reference for how to survive on planet earth. We scream when our needs aren't met and we sleep - that is it. Our parents teach us values and ways of behaving which they believe will stand us in good stead as we get older and have to survive on our own. They do this with the best of intentions, but inevitably they will project their own stuff on to us. They have to do this - it's not possible to explain to a 2 year old that there are "different ways of responding according to our personal truth". Up until puberty, we tend to lap up our parents' teachings (unless there was some kind of abuse). Once we hit puberty, we start to find our own individuality and this is where we push against our parents' rules. This is necessary in order to become our own person, but it is also necessary for parents to hold the boundaries to keep us safe. As with most things, it becomes about finding a balance and renegotiating this throughout the teenage years. If this period of time goes smoothly (or as smoothly as anything can go when it's accompanied by buckets of hormones), we come out the other side as an adult and our relationship with our parents will have moved to become a more adult-adult relationship rather then the parent-child relationship or our younger years. However, often things don't work out quite like that and we're left with relationship problems with our parents. 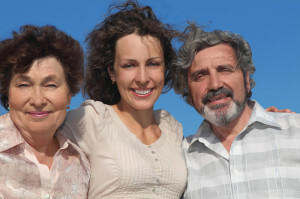 As adults, we start to see our parents' weaknesses - let's face it, none of us are perfect. We start to identify our own values and realise how much they differ from those of our parents. If we're still a teenager or only just out of those years, we can believe that we're right and they are wrong. And this can continue until we resolve it. The other thing that can happen is that we don't grow up from the parent-child relationship into the adult-adult relationship. Sometimes this is down to the parents still treating us like a child and other times it's the child still playing out the same role because they don't know how to change or it feels unsafe to change. Either way, this will have a massive impact on the way we see ourselves and how we behave in the rest of our life. Regardless of how we see our relationship with our parents, that relationship will impact the way we relate to other people. Broadly speaking, our relationship with Mum shapes our relationship with women and our relationship with Dad shapes our relationship with men. The most obvious relationships it affects are those with a romantic partner and our children, but it will have an effect on other relationships too. We tend to look for romantic partners who either have characteristics we liked in our parents or have the opposite characteristics of those we have issue with. Note, I say "have issue" rather than dislike, as often we reject something which is only the symptom of an issue. This is often what we see when young adults go out with "rebel" boyfriends or girlfriends. If they are rebelling against the rules of their parents, a romantic partner who doesn't seem to live by rules can seem very attractive, even if deep down they like stability and predictability in their lives. Then when we have children and we have to find a way to parent, out comes the first manual we have experience of - the manual of Mum and Dad. On instinct, we behave the same way unless we've consciously made a decision to do something different. The major things will be easy to change because they are the significant ones. It's the little things we tend to do the same. How often do you hear women say with a groan, "I'm turning into my Mum". I'm sure men find the same thing with their Dads. Now, this is not necessarily a bad thing if we've resolved any issues in our relationships with Mum and Dad. If we can openly feel the love for our parents and appreciate them for all their good qualities, then turning into a version of them as we get older might not seem such a terrible thing. But if we haven't resolve the relationships, then this might seem an awful thing. The good news is that, like everything, our relationships can be healed. Our parents were usually doing their best, even if we feel that the best wasn't very good. Maybe they were coming from a dysfunctional relationship with their own parents, or were trying to adjust to society's rules of the time. By healing the relationships, we free us up to not only have a better relationship with Mum and Dad, but also to have better relationships with others. Our self worth will rise and we will start to attract people on a more equal basis. We will start to be more comfortable with who we are and we will present that to the world, rather than a mask of how we feel we ought to behave. And finally, we usually out-live our parents, so if you want to have a better relationship with them, start looking at healing it sooner rather than later, because once they have gone, although the relationship can still be healed, you may find you have regrets that you weren't able to share it with them.